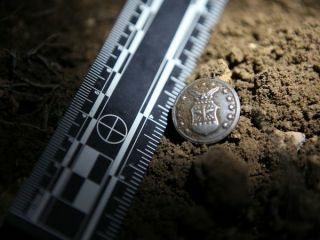 A military button found at a famous UFO crash site. Did a UFO really crash near Roswell, N.M., in 1947? What was that mysterious triangle of lights that hundreds of people spotted over Phoenix, Ariz., last fall? Are alleged alien abductees telling the truth? For a new series on the National Geographic Channel called "Chasing UFOs," a team of investigators visited UFO hotspots around the world and interviewed witnesses in an attempt to address some of history's most famous purported evidence that aliens have visited Earth. We caught up with Ben McGee, a geoscientist and the lead field researcher on the UFO-chasing team, as well as its only skeptic, to get a taste of what he and his team discovered. "I tried to help illustrate applying critical analysis to the range of alleged evidence," McGee told Life's Little Mysteries. "The difference between UFO believers and astronomers is on the one hand you have people who find the data to support their hypothesis, and on the other you have the guys who attack their own hypothesis — who know there's a huge range of possible other explanations." At Roswell, McGee and his team conducted a "recon-style survey" of the area around the alleged UFO crash site, testing for radiation and geomagnetic activity. They got lucky. "We were doing some perimeter sweeps with metal detectors and got a hit," he said — it was a button from an Air Force member's coat. The UFO chasers made another stop in the Southwest, in Phoenix, and spoke to people who saw a bizarre triangle of green lights moving slowly across the evening sky last September. The lights were definitely real — they were seen by many and recorded on video — but were they a UFO? The UFO chasers also interviewed many credible witnesses who believe Earth is being visited by aliens, including the moon-walking Apollo 14 astronaut Ed Mitchell. They also spoke to three women who claimed to have seen an injured alien creature near an alleged UFO crash site in Varginha, Brazil in 1996, and to a self-described alien abduction survivor in Colorado. One of McGee's fellow investigators on the show, James Fox, a ufologist and filmmaker, became convinced that the witnesses were telling the truth. McGee did not. "Chasing UFOs" documents these and other exploits by McGee, Fox and fellow investigator Erin Ryder. The weekly series premieres on the National Geographic Channel Friday (June 29) at 9 p.m. ET/PT, with a second episode the first week at 10 p.m.
"People who are curious about UFOs are asking the right sorts of questions. They are curious about the possibility of life in the universe. This project has been an opportunity to engage with them," McGee said, "and to let people know there's no such thing as a bad question." This story was provided by Life's Little Mysteries, a sister site to SPACE.com. Follow Natalie Wolchover on Twitter @nattyover. Follow Life's Little Mysteries on Twitter @llmysteries. We're also on Facebook & Google+.